Gardenias are admired for their glossy green foliage and fragrant blossoms. However, gardenias are particular about their growing conditions and require consistent maintenance in order to keep happy and beautiful. Once you understand what a gardenia needs to survive, growing them is very rewarding. Gardenias are often found outside in southern regions. They are grown as ornamental shrubs in warm regions and as patio plants that are brought indoors in cooler areas. 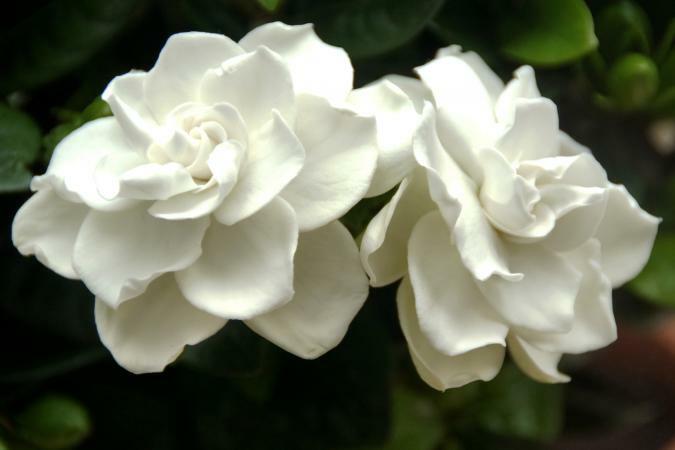 Paying attention to the particular growing requirement of gardenias is especially important. If you provide the gardenia with the right conditions, it will reward you with vibrant foliage and a proliferation of fragrant blooms. 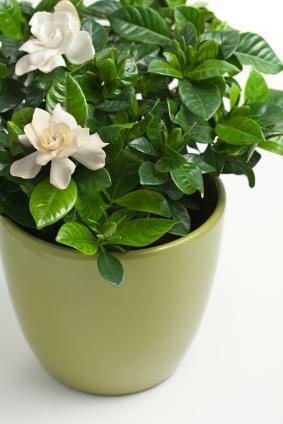 Well-drained, acidic soil with a pH of 4.5 to 5.5 is ideal for gardenias, whether potted or in the ground. During the day, gardenias prefer temperatures from 68 to 74 degrees with a low of 60 degrees at night. Moderate humidity assures a healthy plant but soggy roots cause flower buds to drop, as will soil that is too dry. Adding peat moss to the soil will benefit your plant by helping it retain moisture without becoming too wet. While the gardenia likes humidity, misting the leaves can cause problems. Water droplets can lead to fungal growth on leaves. This is important to keep in mind if you plant your gardenia outside. You don't want to place it under plants that drip onto its leaves. You must also be careful your plants are not crowded too close together. A lack of air flow also causes fungal issues. When you water potted plants, check to see if the top inch of soil is dry by poking your finger into the soil and then give your plant a good soak. Any water that accumulates in the tray under the pot should be drained out. It is a great idea to place gardenias in a pebble filled tray. Water can be poured over the pebbles to provide moisture and humidity without excessive water being absorbed into the soil. Outdoor gardenias prefer full sun, with some shade in the hottest summer months. Indoor gardenias should not be placed in direct sun, but in a room that gets plenty of bright, indirect light. Temperature is considered one of the most crucial aspects of growing a gardenia. When daytime temperatures are above 70 degrees F or if night temperatures are over 65 degrees F or below 60 degrees F, flower buds will not form. Keep your gardenia between 65 and 70 degrees F during the day and 60 to 62 degrees F at night. 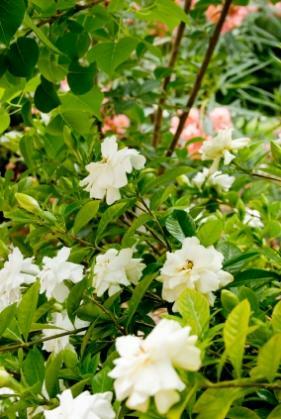 Feed gardenias every three weeks during the growing season with an acid-based fertilizer. If you are fortunate enough to live in a climate where these tropical plants will grow outdoors (zones 8-10), you may want to plant one near a window or patio to fill the air with its intoxicating scent. The process is simple as long as you remember the basics of gardenia plant care. Be sure to plant your gardenia in well-draining soil conditioned with peat moss and organic matter. Dig a hole twice the size of the gardenia's root ball and just as deep as the container. When you place the plant into the hole, be sure that the top of the root ball is slightly above the soil's surface. Mound a mixture of native soil and peat moss around the plant and tamp down to eliminate air pockets. Water thoroughly and keep well-watered during the growing season. There are several things that you can do to improve the health and longevity of your outdoor gardenia plant. If you take good care of your plant, it will perform to its maximum potential year after year. Prune: While it is fine to cut gardenia plants back as far you would like in order to shape, be sure to do your pruning when the plant is dormant. Use only clean pruning shears and do not cut all of the leaves off of the plant. Mulch: Mulch will help with moisture retention. You can use pine needles, bark, finely shredded bark or other organic matter. Provide a mulch covering that is two inches thick and do not allow the mulch to touch the trunk of the bush. The best way to protect any plant from pests is to keep it healthy and prevent over-crowding. Other common causes of insect problems include allowing too much moisture to sit on the leaves and not maintaining the proper temperature and moisture levels. Keeping gardenias in the proper conditions goes a long way toward protecting them from common pests. While gardenias are picky about their care, if you are patient and remember the basics, your efforts will be rewarded. A beautiful blooming gardenia is worth it.